Presentation of $57,575.75 Total Donations to Area Churches! 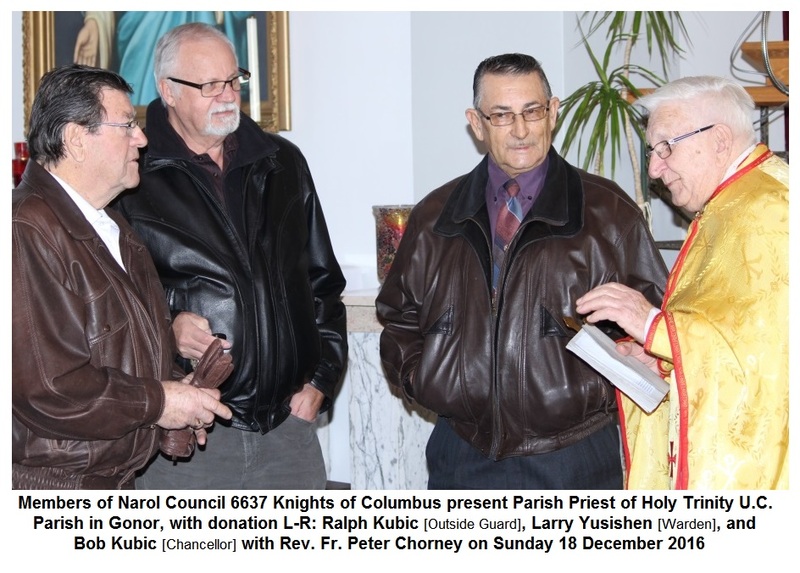 The money being donated was raised by the Knights of Columbus, of Narol Council 6637 as part of a building fund intended originally to provide a home for Narol Council in the early years following the charter (2 December 1974). The membership was and is widespread and ranges as far north as East Selkirk & Selkirk, east to Tyndall, Oakbank, and Lac du Bonnet, and south into Bird’s Hill and Winnipeg. The presentation of the differing amounts was determined by the brother knights, belonging to the various churches, who designated to which charity they wished to make a donation. Among other religious, youth and family oriented activities Narol Council 6637 also annually offers a scholarship of $750 for high school graduates who are the children or grandchildren of Narol Council members to help defray the costs of further education. They also hold the “Keep Christ in Christmas” colouring/collage contest to highlight the true meaning of Christmas among the younger folks with small cash prizes awarded as a way of thanking those who make the effort to participate. Charitable donations are made based on their merit and the council has donated varing amounts including $1000 to aid in the purchase of an insulin pump for a diabetic child and on more than one occasion $500 or more for repairs to church roofs and for furnace replacement. Charity is one of the cornerstones of the Knights of Columbus as a Catholic fraternal organization. Members of Narol Council 6637 presented Fr. Peter Chorney, pastor of the Ukrainian Catholic Parishe of the Holy Trinity in Gonor, MB with a cheque of over $9,000. This took place on Sunday 18 December 2016 – which was very appropriate as the day was the eve of the feast of St. Nicholas on the “old calandar”. St. Nicholas is revered around the world as one who gives generously in times of need. Narol Council 6637, represented by Trustee Ken Nixon and Advocate Steve Fedak, presented pastor Rev. 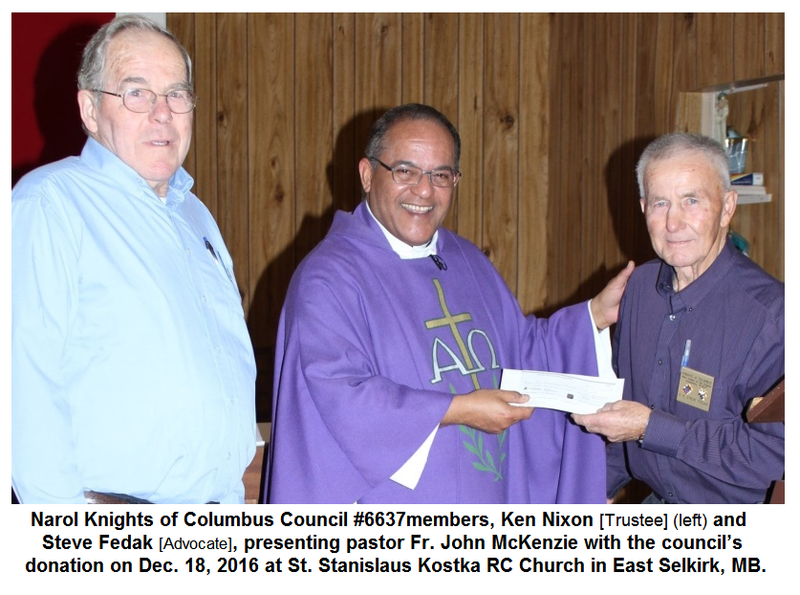 John McKenzie (who is also the Chaplain of the KofC Narol Council) with the council’s $9,090.90 donation cheque also on Sunday Dec. 18, 2016 at St. Stanislaus Kostka RC Church in East Selkirk, MB. Narol Council also plans to present a donation of just over three thousand dollars to Blessed Virgin Mary the Protectress Ukrainian Catholic Church in East Selkirk, MB for some much needed renovation work. Fr. Choney is also the pastor at that church and the decision was made to make the presentation at a future Sunday Liturgy that the parishioners can share in the joyful moment. 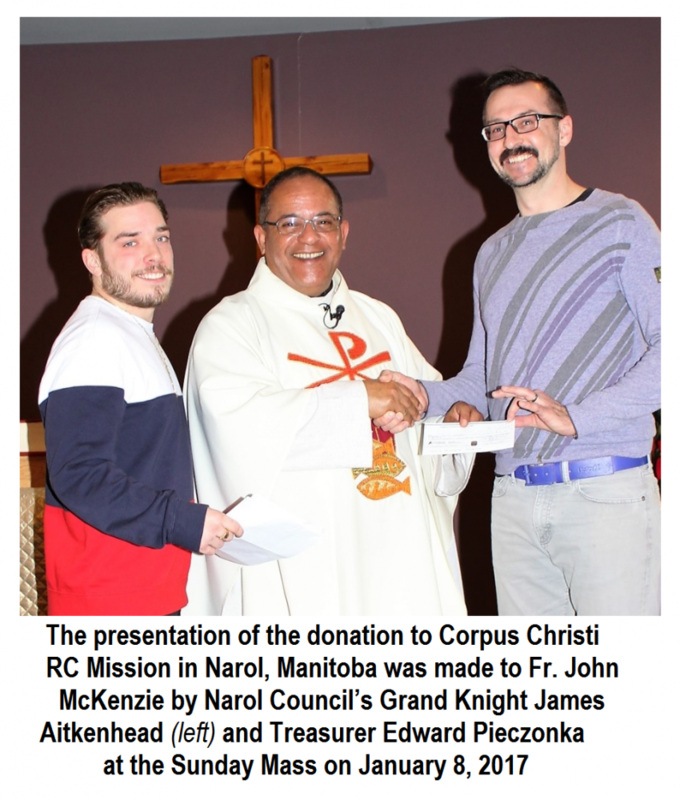 The largest donation of over $36-thousand was designated for Corpus Christi Roman Catholic Mission in Narol, Manitoba (chaplaincy of St. Stanislaus Kostka in East Selkirk, MB) was presented to Fr. John McKenzie by Narol Council’s Grand Knight and Treasurer at Sunday Mass on January 8, 2017.